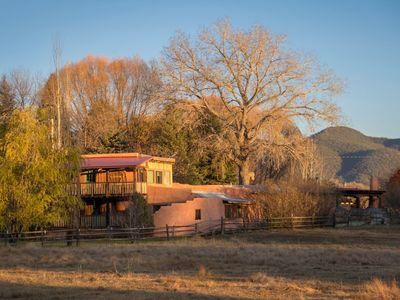 Casa de Luz ('House of Light') is a private residence with views in a location in a quiet/private setting with 2 bedrooms, each with their own bath, in a 1400 square feet 1-level home situated on 1 and 1/3+ acre including a large area enclosed by an 8' latilla fence for guests seeking privacy. 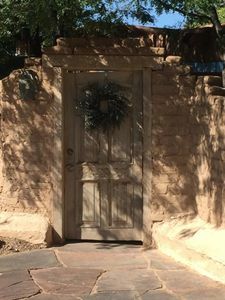 Please be assured we respect both your privacy and safety. 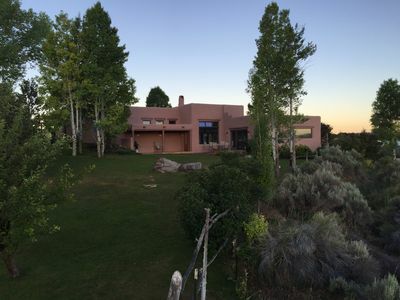 Casa de Luz is secured by an outdoor camera system focused on the property's perimeter. 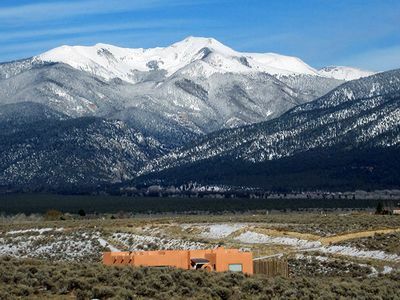 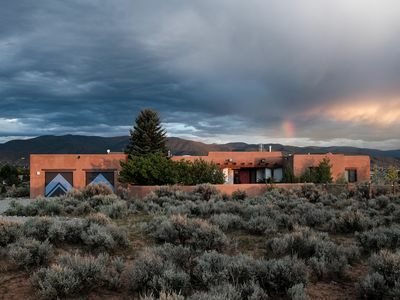 Casa de Luz is nestled in a rural high-desert meadow a short distance from the Town of Taos & below Taos Ski Valley with panoramic views of Wheeler Peak (the tallest point in New Mexico), Taos Mountain & the Sangre de Cristo ('Blood of Christ') Mountains. 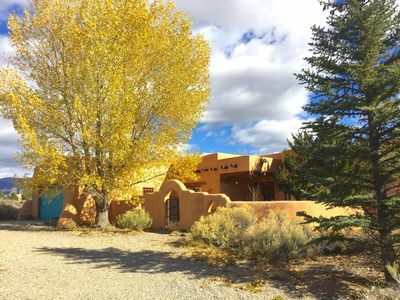 You will enjoy a location away from the Town of Taos's traffic noise/congestion & night light pollution yet convenient to both the Town of Taos & Taos Ski Valley while staying in a home furnished with local artists' works & modern living comforts yet with the feel of Old Taos. 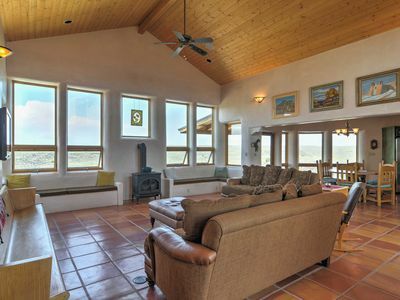 No parties, large groups, or loud music. 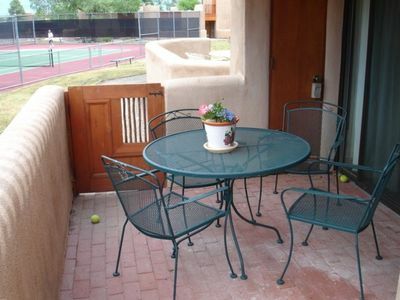 Please enjoy the quiet surroundings while being respectful of our neighbors in our rural residential neighborhood. 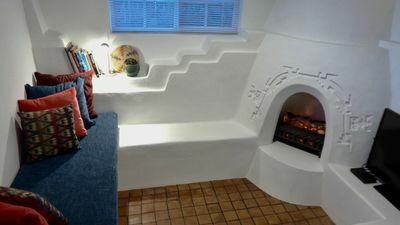 INSIDE: Fully furnished open living, dining, bar & kitchen area with floor to ceiling windows for mountain views, radiant brick floor heating throughout, high ceilings graced by beautiful unpeeled vigas & recessed lighting, a cozy free-standing gas log stove, a surround sound stereo system with speakers in all main rooms & MP3 player connection & alcove with desk with high-speed Internet/DSL connection & high-speed Wi-Fi throughout the house. 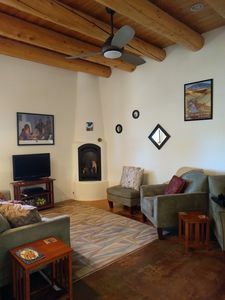 LIVING AREA AND KITCHEN: Open living, dining & kitchen area include a queen sleeper sofa and a twin sleeper love seat, along with two rocker/gliders, a 39' satellite HDTV, including digital video recorder (TiVo) & DVD player, wired through stereo speakers in the Great Room and bedrooms, new full stereo system including iPod/MP3 player connection and CD player. 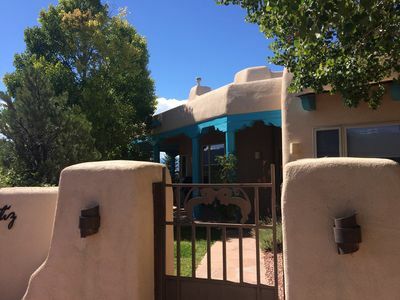 The kitchen, with its custom tile countertops & hand-carved cabinets, is fully equipped with dishware/silverware/cookware/glassware/modern appliances, including microwave/toaster oven/crockpot/blender/food processor/steamer/coffee pot & grinder,etc. 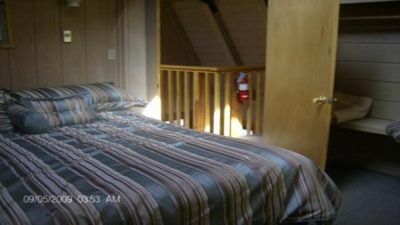 BED/BATH: Each bedroom has its own 32' satellite HDTV with digital video recorder (TiVo), DVD player, iHome clock/radio/bluetooth/USB port, separate radiant floor heating system, ceiling fan, mountain views, a queen-size bed, phone, & private entrance to the covered portal where the hot tub is located. 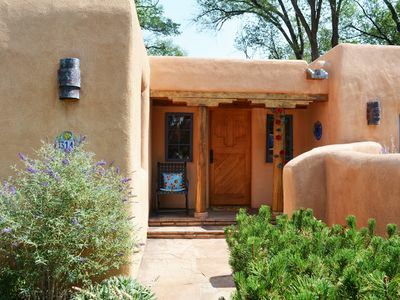 Each bathroom, one with a bathtub/shower & one with a shower, is furnished with a hairdryer, hand-carved cabinets, ceramic-tiled vanities, talavera sinks & brass fixtures. 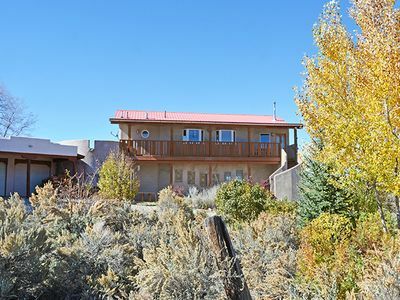 OUTSIDE: FABULOUS VIEWS! 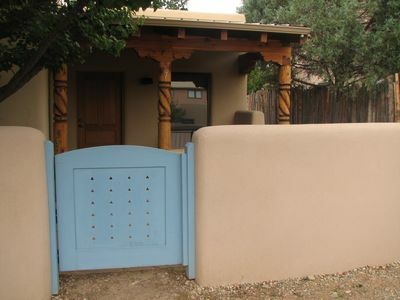 8' LATILLA FENCED BACK YARD for privacy with open-air bricked patio with charcoal grill (bring your own briquettes & lighter fluid), seasonal hummingbirds & songbirds & year-round cottontail rabbits & birds, separate covered & latilla fenced portal area with entrances from each bedroom to the hot tub. 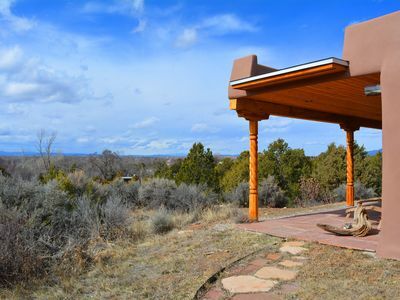 This is truly a place to retreat for privacy & serenity to enjoy & relax with magnificent mountain views by day & enchanting stargazing by night. 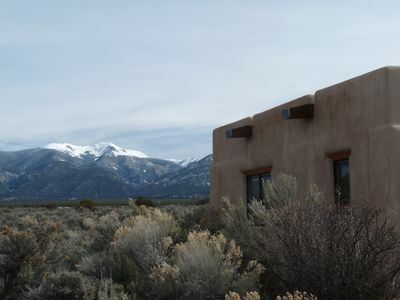 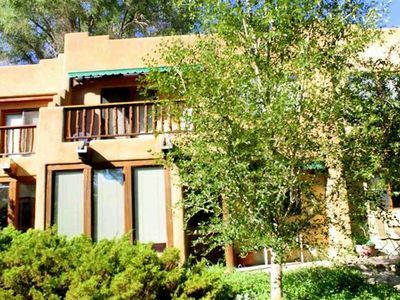 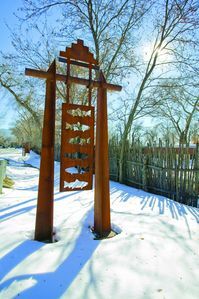 NEARBY: 15 minutes to Taos Ski Valley; 5+ minutes to Town of Taos. 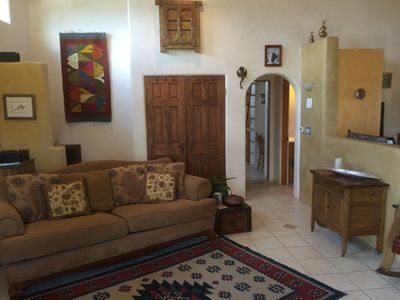 Wonderful restaurants, wine store, live music & dancing only 1 mile away. 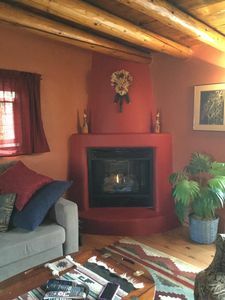 Beautiful cabin #1 in Angel Fire, NM available week of August 5 - 12, 2018.